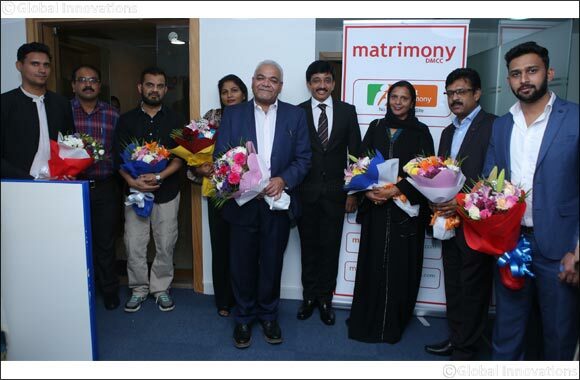 December 4th, 2018; Dubai, UAE: As part of its strategic expansion plans, Matrimony.com, the leader in online matrimony, has entered the UAE market through its flagship brand BharatMatrimony. It has inaugurated an office at Fortune Executive Tower, Jumeirah Lake Towers, Dubai, to serve Indians in the Middle East region. The publicly listed company Matrimony.com headquartered in Chennai, India, aims to offer matchmaking services and marriage services across the region through its office in the UAE. BharatMatrimony is the largest and most trusted matrimony brand which has also established a considerable retail presence with over 135 self-owned retail outlets across India. The Company delivers matchmaking and marriage related services to users in India and the Indian diaspora. Customers who have queries about finding a life partner or want to know about personalised services on any of BharatMatrimony’s 15 language services including KeralaMatrimony and TamilMatrimony; and other services like EliteMatrimony or CommunityMatrimony can now get quick help. With annual revenue of more than Rs 330 Crores in FY18, Matrimony.com currently offers matchmaking and marriage services to over 3 million active members across the globe.